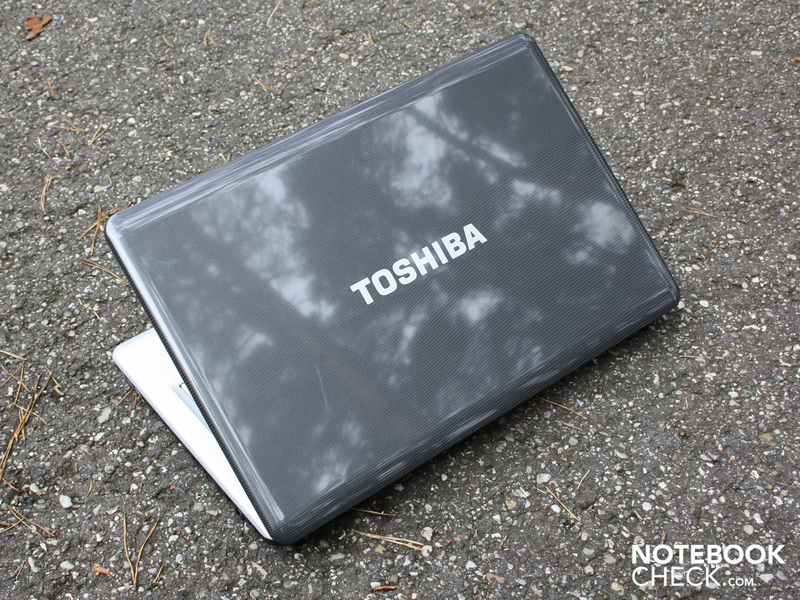 There is rarely a gamer amongst Toshiba's low-priced laptops. The manufacturer makes an exception with ATI HD 5165 at a price of 670 euro. The HD 4650 twin even does well in current games and yet doesn't need a strong CPU to do that. Old wine in new bottles? AMD doesn't want to stay sitting on the ATI HD 4650 graphic card model and has simply renamed the chip to HD 5165. The HD 4650 isn't capable of DirectX 11 right away with that, but the graphic core looks brand new on the package and suggests DirectX 11 compatibility to a layman. But Nvidia isn't much better and releases the 3 series simply without DirectX 11 onto the market. We don't want to make this review dependent on AMD's and Nvidia's distraction strategies of naming graphic cores, though. 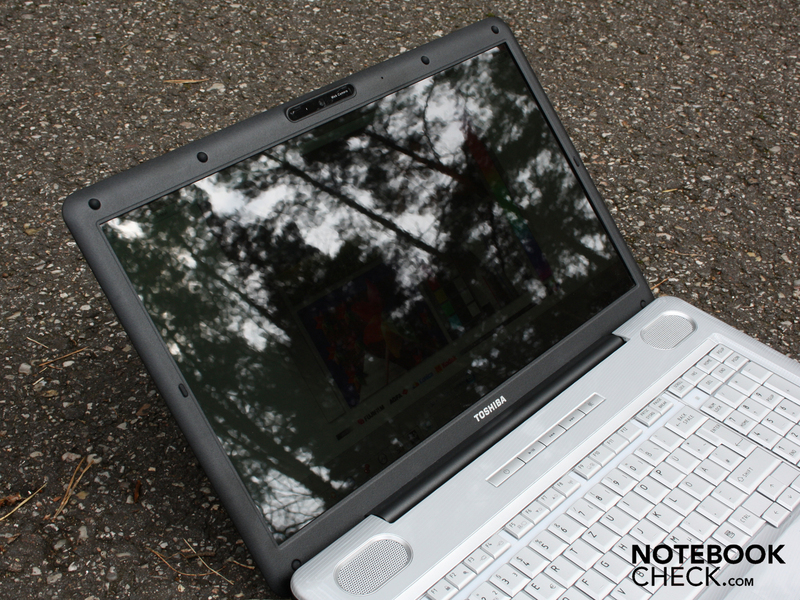 The paramount is Toshiba's L550-207 and its capabilities as a multimedia and gaming laptop. 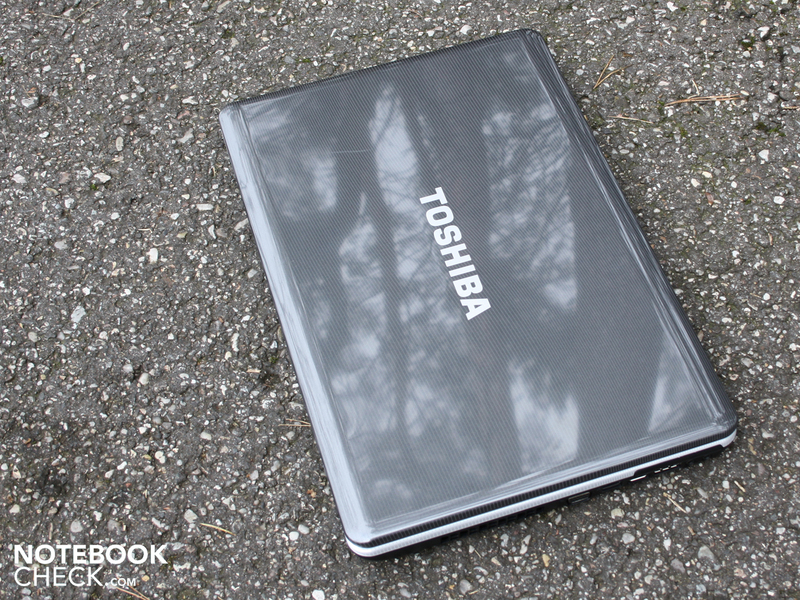 Toshiba tries to lay it on thick with broad forms and exaggerated roundings in the L550's looks. This approach is successful, as a design is created that can't be confused with any competing products. 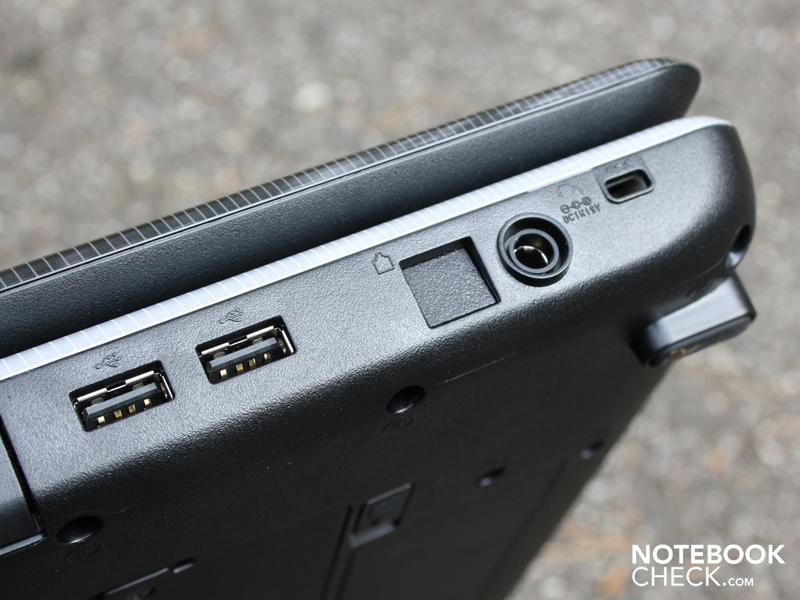 Particularly, the submerged loudspeaker grids and the touchpad keys hint at an entertainment laptop. The Satellite L550-207's case looks plain and practical. Due to this and of course, because of the keyboard's size, employment in the office fronts appears feasible. Office workers won't have the ideal conditions with the glossy work surfaces, though. However, smeary areas won't stay left visible due to the silver-gray color and the striped finish. Overall, the combination of glossy (wrist-rest) and sober, matt surfaces (bezel, keys) give the L550-207 a serious but slightly playful look. The latter fits to the 17.3 incher, as we'll find out in the gaming test. The bezel has a good fit and makes a solid impression. 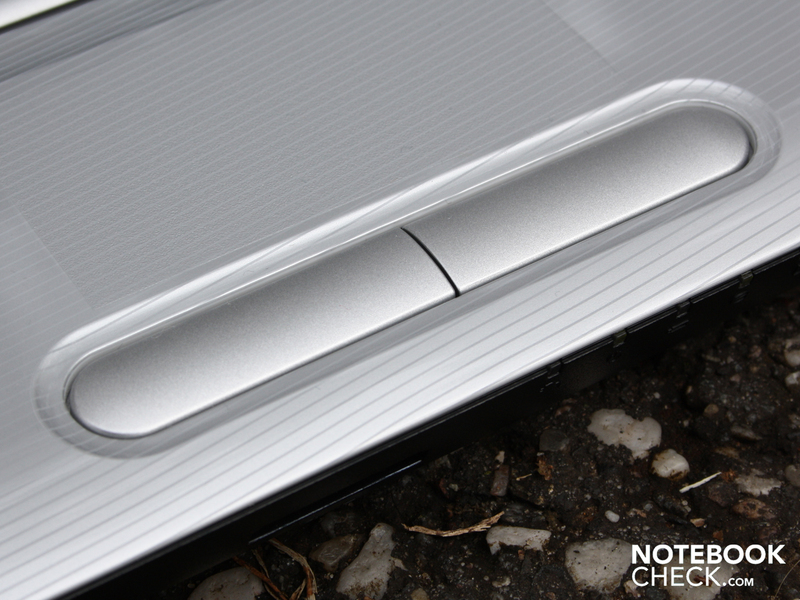 We can neither twist the chassis with both hands nor can we force the wrist-rest to dent. Nevertheless, the hollow sounding wrist-rest, the TFT bezel's plastic look and the coiling keyboard just can't convey a high-quality impression. The lid isn't perfect, either. We can depress it obviously without force. Just like we can twist its sides when we pick it up at a corner. The hinges keep the heavy lid securely in position and only have a slight tendency to teeter. Although they sit tight, the user only needs one hand to open the lid. This is due to the base unit's heavy weight. The hinges sit tight in their submerged molding. The maximum opening angle is more than sufficient for a use on the lap. The lid can't be opened further than 180 degrees (circa 130 degrees). We can't dent the plastic base plate anywhere. All abutting edges are joined evenly and make a well-manufactured impression. The big cover on the bottom bids the option of exchanging hard disk and RAM. Users don't have an easy access to the Mini PCI Express slot, on which the WLAN/Bluetooth card sits. The complete base plate has to be removed for that. Toshiba equips its 17.3 incher with the most important interfaces in terms of connectivity. Despite the vast space available, extras such as FireWire or a display port are left out. 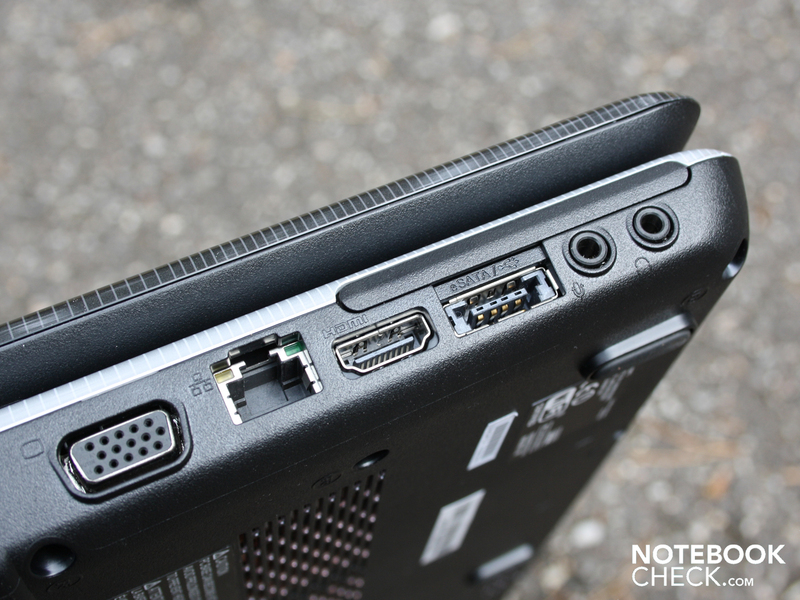 As it applies to many laptops: Connections on the rear would bring more order on the desk. But there aren't any here because the deep-hinged display prevents this completely. If you imagine a massive cabling with audio, eSATA and HDMI (left), you'll see an ugly cable harness that doesn't allow much place for using a mouse (lefties). Righties have a clear advantage. Nevertheless, they also have to push the mouse pad aside when a DVD is inserted into the tray. Left: One 3.5mm headphone-out, one microphone-in, an ExpressCard54 slot, as well as one HDMI, one VGA and one Ethernet port. 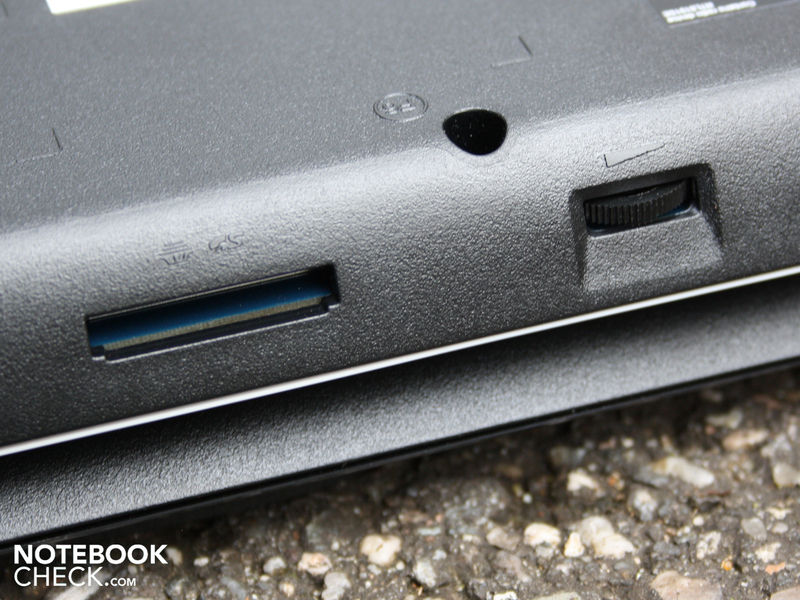 Right: Merely two USB ports and an obstructive power plug, because it's straight, are on this side of the case. The previously placed modem port hasn't been punched out, as it still is a relic of those times as 56K was quite sufficient for internet access. If you prefer using DSL instead of modem speed, you can do this with the draft-n standard. The wireless card, RTL8191SE 802.11n, supports this current standard. But high speed isn't available on the wired side. The Realtek RTL8102E is only a Fast Ethernet (10/100MBit) network card. The domestic gigabit switch will thus be quickly overtaxed. Bluetooth, for connecting to small devices such as headsets or navigation units, isn't available, either. The manufacturer has obviously saved on connectivity in view of the price. 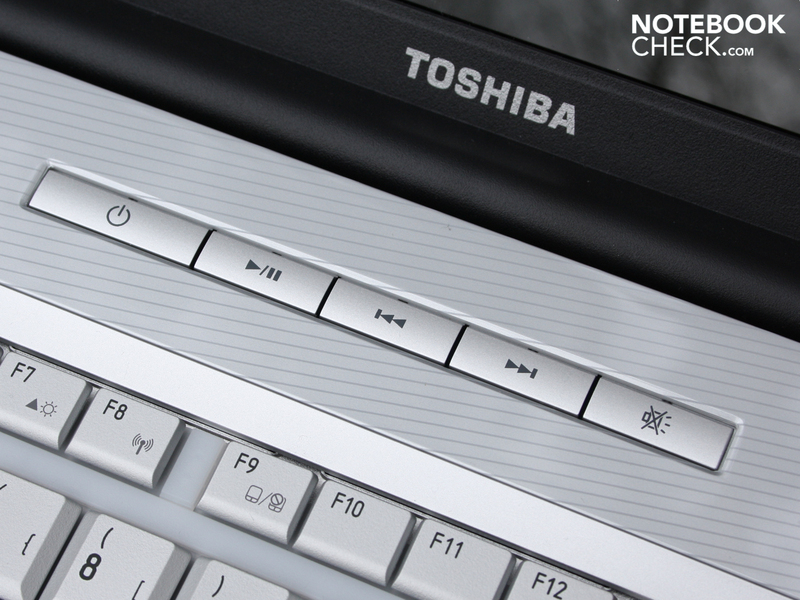 Toshiba has opted for a pleasantly sized keyboard layout. The trend of detached keys, which almost all other manufacturers follow, is negated. The keys, in a classic chocolate design, are placed tight beside each other and have beveled edges. They are also slightly concave, so with a slight inward curve. This improves the fingers' position and is especially favored by touch-typists. 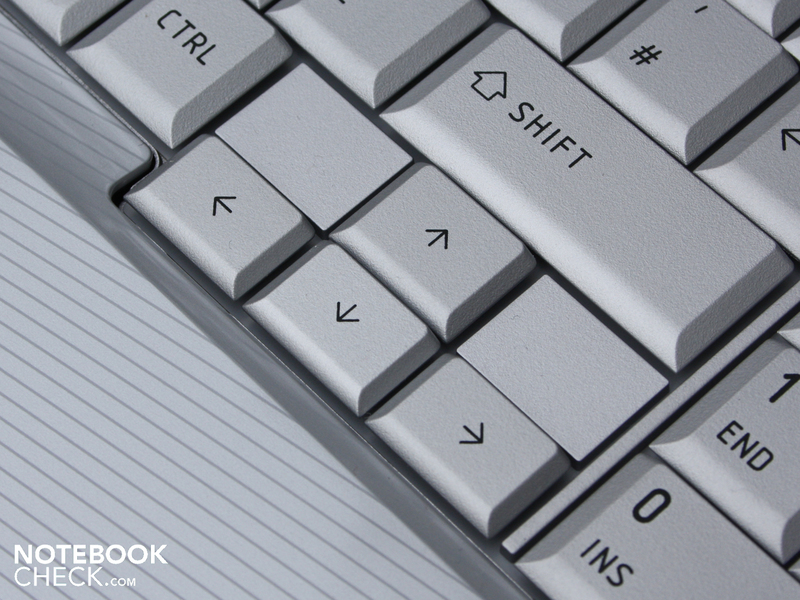 The keys provide the typist with a distinct pressure point and a long key stroke. The stroke is, however, vague. The key field coils in the center and front area, as well. The keyboard plate doesn't fit precisely and coils. This provides for a clattery feedback during typing. Toshiba integrates a number pad and uses the given size of the 17 inch case completely. The number pad simplifies inputting numbers. The clear spacial separation of the single keyboard areas by a white, or rather silver, crosspiece also appears to be praiseworthy. 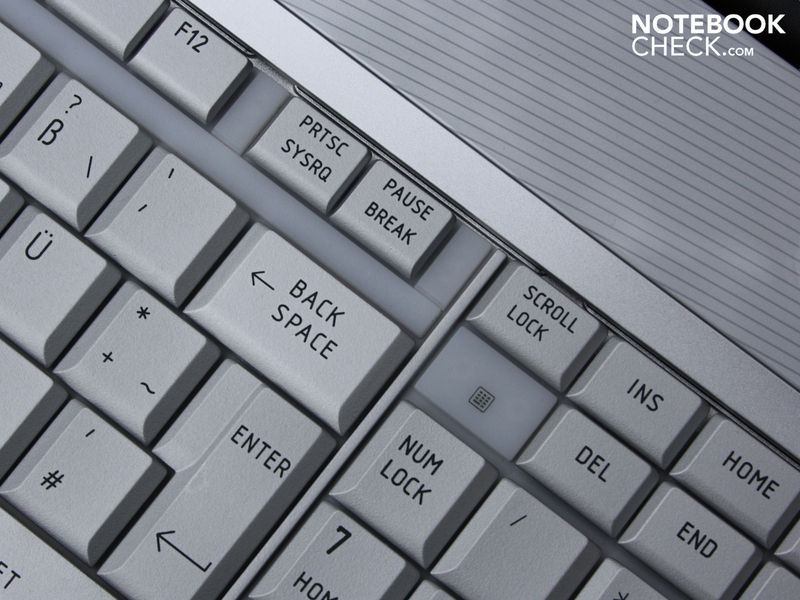 Thus, the "F" keys are separated from the rest of the keyboard and can therefore also be found without looking. The same applies to the number pad. A bridge outlines the border between it and the main keyboard. The manufacturer has also considered the offset arrow keys. Wrong inputs barely have a chance due to the small gap to the shift key, even in hectic situations. The mouse substitute (multi-touch pad) is part of the wrist-rest. The sensitive area has a different feel, though. This is accomplished by a thin, slightly matt coating. The sensitive area's large field is advantageous. The field has a vertical and a horizontal scroll bar - even if these aren't visibly marked. 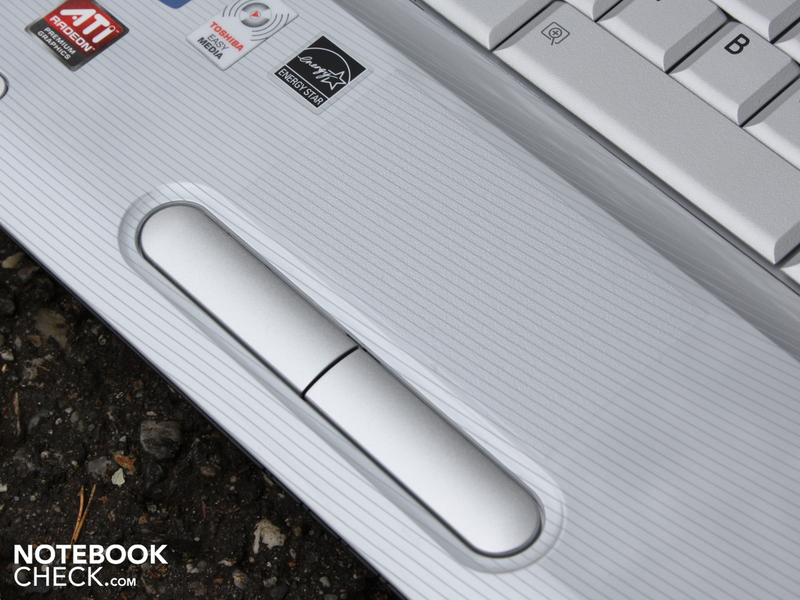 Unfortunately, the scroll bar can only be found with difficulty, as there is no touchpad edge or the like for orientation. 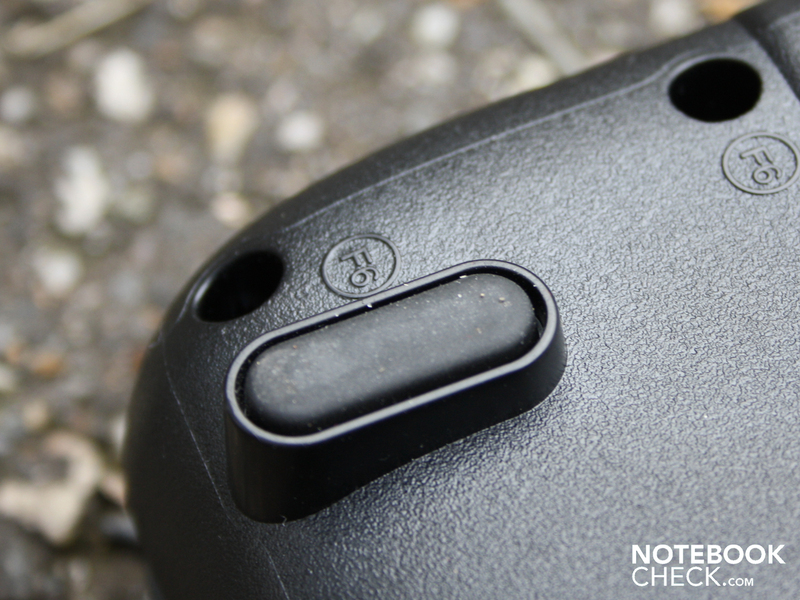 The round and slightly convex keys have a high pressure point and provide feedback with a loud, dull click. This hard feedback quickly gets annoying and lets you look for an external mouse. The cavity in which the two keys are placed doesn't turn out to be obstructive. 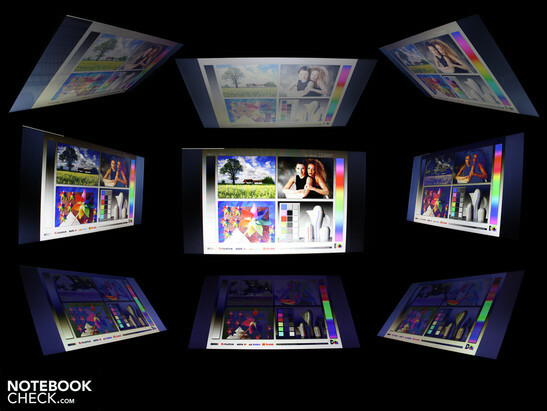 The 17.3 inch LED TFT has a resolution of 1600x900 pixels (HD+). The screen's contrast is determined by a poor black value of 1.32 cd/m2 at almost highest luminosity. 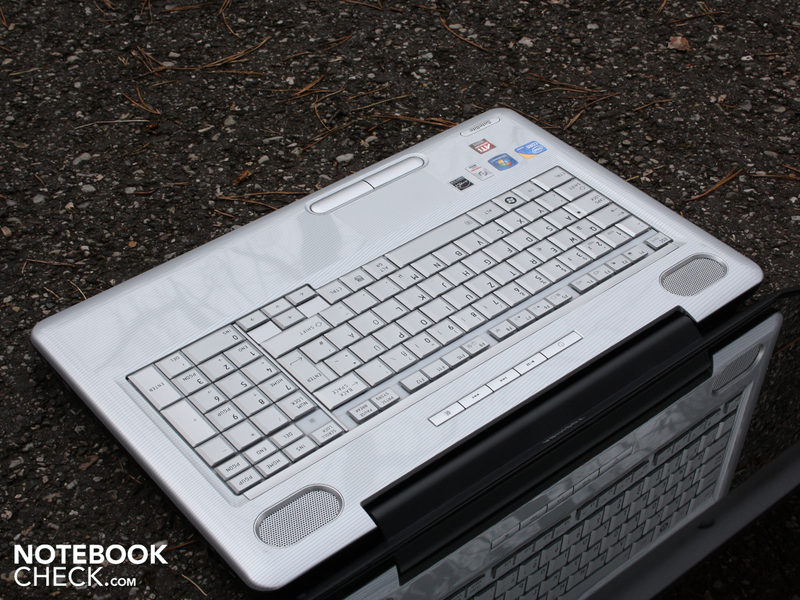 160:1 are typical for office notebooks, netbooks and, unfortunately, for many multimedia all-rounders. The reflective display can, however, improve the low contrast somewhat. The poor contrast is a tragedy for a notebook fairly suitable for gaming. Black areas aren't deep black. Colors aren't as brilliant as they could be on superior LED displays. Buyers with a high demand on color fidelity and/or brilliant colors should look for an alternative. This may, for instance, be an external monitor. The small color space (ICC profile) also shows that the L550-207 is only capable of a small amount of the representable colors (GAMUT). However, this is more important for professional users than for entertainment-seeking users. The luminosity measurement on the display supplies adequate results with 210 cd/m2 on average. The illumination is relatively homogeneous (83%), although the Samsung TFT (173KT01-T01) achieves 231 cd/m2 on its brightest spot and only 192 cd/m2 in its dimmest area. However, this difference isn't visible to the eye. The user needs a luminosity of only 150 cd/m2 indoors. If necessary, the user can dim the brightness accordingly for games. 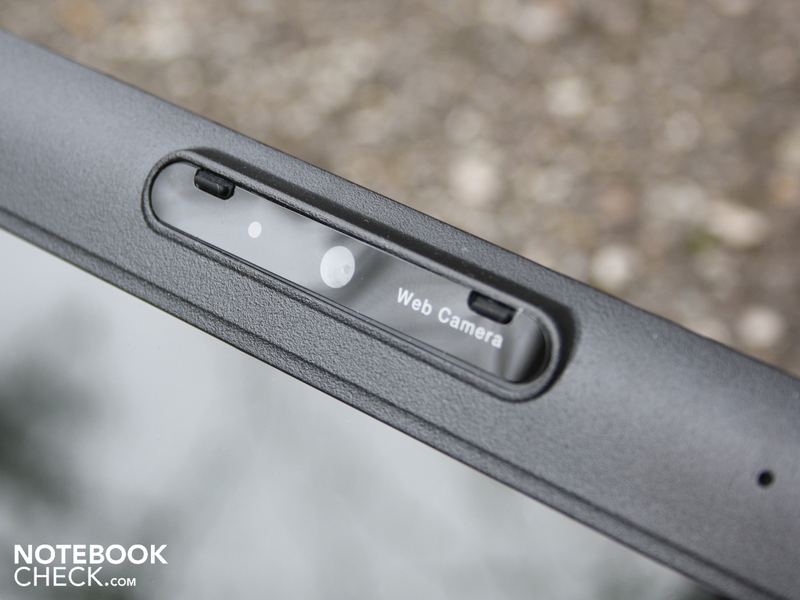 The Samsung TFT screen's vertical viewing angles are very narrow. The viewer's eyes should only deviate up to about 20 degrees upwards or downwards. Beyond that, the colors are very evidently inverted. The same applies to views from the upper or lower sides. Colors look totally different (inversion) and writing can't be read any longer due to the dimming. Eyes can deviate up to 45 degrees on the horizontal plane before the display obviously dims and colors are falsified. The Satellite L550-207's narrow viewing angles can be recognized well on the picture. Intel's Core i3-330M processor belongs to Intel's weakest Arrandale processors with 2 x 2.13 GHz. Nevertheless, the TDP is a high 35 watts. The L2 cache has a capacity of 3 MB. The i3-330M, like the i5-520M, uses a IGP graphic unit. The Intel HD has been, however, disabled by the OEM supplier. The image is rendered by a dedicated ATI Mobility Radeon HD5165 (1.024 MB GDDR3) instead. More about the GPU in the part about "Gaming Performance". The Core i3-330M is capable of hyperthreading (HT) in opposition to the Core 2 Duo predecessors. HT provides every physical core with an additional virtual core. The native dual-corer can, therefore, compute with a total of four cores. The Core i3-330M is supported by a 4096 MB DDR3. This has been divided among two modules and can be used efficiently by the pre-installed 64 bit Windows 7. Generally speaking, the Satellite L550-207 with a Core i3-330M (2.13 GHz) is more effective than many processors of Penryn's previous generation (Core 2 Duo). However, the CPU isn't per se faster. A difference is made between multi-core and single-core computing in this statement. If applications or games only use one or two cores (single-core), then the i3.330M is at a disadvantage due to its low clock rate of 2.13 GHz. The computing rate is only slight higher than that of a T6600 (2.20 GHz), or a P7450 (2.13 GHz). The i3-330M is on par with the strongest dual-cores of the Core 2 Duo generation in multi-core computing. T9500& (2.6 GHz) or P8800 (2.66 GHz) can be named here. The reason for the new power reserves: Intel's hyperthreading (HT). Multi-core applications can benefit from it. PCMark Vantage established a system performance of 4956 points. All components, starting with the processor over the hard disk up to the main memory, are evaluated in this test. Due to hyperthreading, the i3-330M system, L550-207, can achieve a performance for which an Alienware M17 (Intel QX9300, HD3870) or the gaming machine Cyber System QX18 (T9900, GeForce GTX 280M SLI) would have been needed a few years ago. It has to be mentioned that the strong graphic cards in this machine only have a little impact on the application performance test. The only thing that counts here is a fast processor (multi-core), a swift hard disk and a quick RAM. 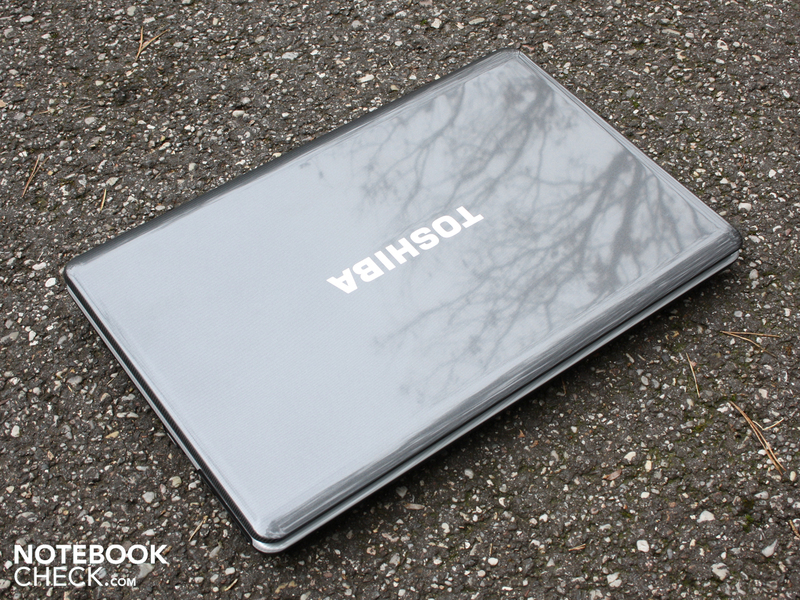 The Satellite L550 has to admit defeat when compared to current competitors, though. A Samsung R580-JS03DE (i5-520M) is considerably faster with 6026 points, just a Sony's Vaio VPC-F11Z1/E (i7-720QM) with 5844 points. 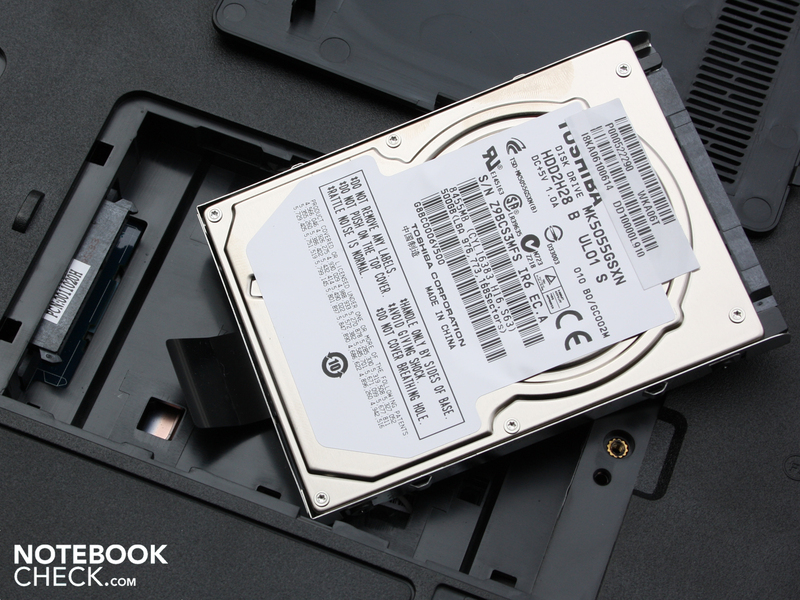 The hard disk with a capacity of 500 GB is from Toshiba (MK5055GSX) and rotates with 5400 rpm. Its velocity is average and really not overwhelming. We've determined 56.4 MB per second with HDTune. 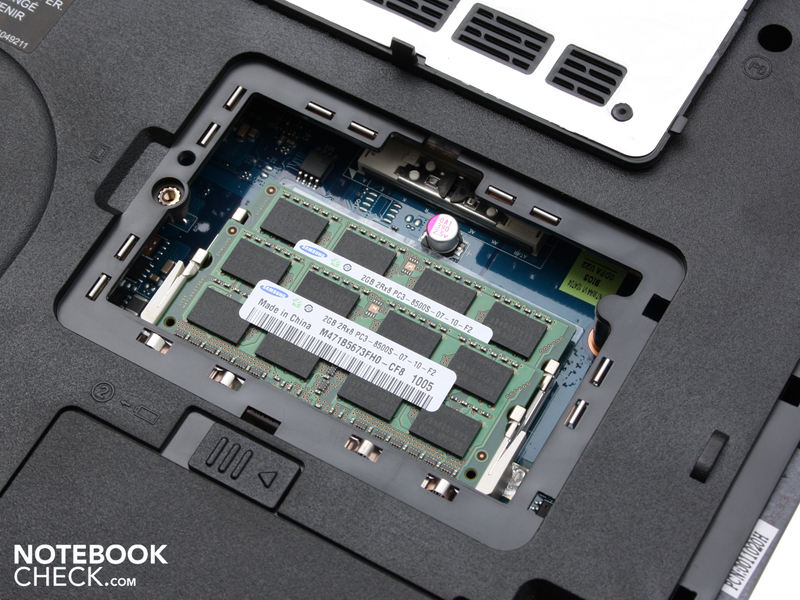 The best 2.5 inch notebook HDDs accomplish more than 75 MB per second in sequential read. 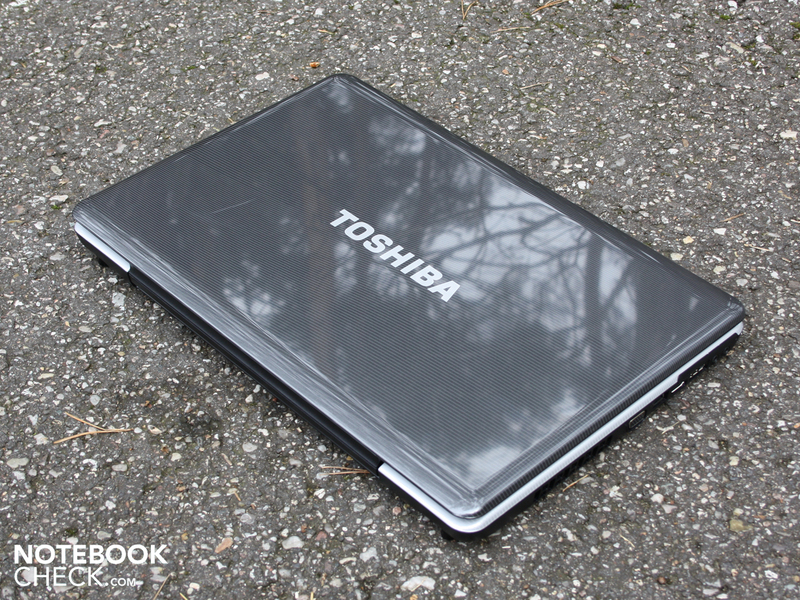 The Toshiba hard disk can be heard due to a quiet basic noise during use - however only when we put our ear on the wrist-rest The write and read heads clatter very quietly at work, but are always drowned out by the almost consistently running fan. An ATI Radeon HD5165 with a 1024 MB GDDR3 memory does its work in the 17 inch case. The GPU core has a clock rate of 600 MHz, the memory 800 MHz. The name could be misleading at first sight because the 51xx reminds of a weak starter graphic of the 5 series. But far from it. The HD5156 is a renamed HD4650, which inherits DirectX 10.1 compatibility. But the clock rate has been increased slightly. A HD 4650 usually clocks with 550 MHz in the GPU core. However, there are also (rare) 600 MHz versions. 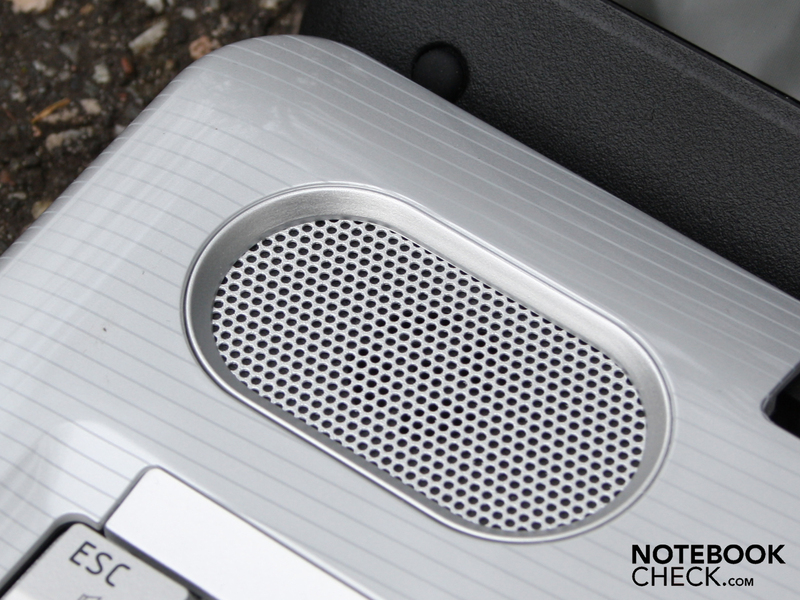 Briefly, the built-in HD 5165 should perform almost on par with a 600/800 MHz clocked HD 4650 (GDDR3). These were rather rare because barebone manufacturers often opted for the 550 MHz and slower DDR2 memory. 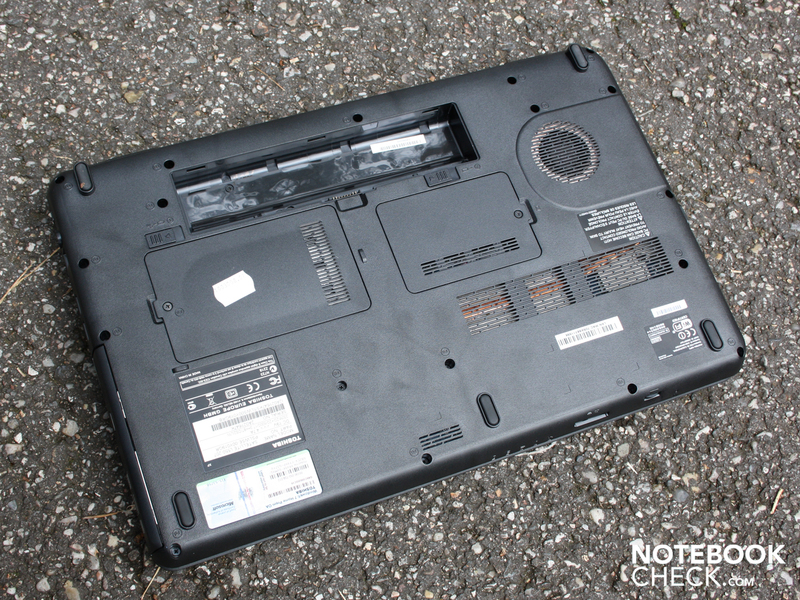 See Acer's Aspire 5940G notebook or Asus' M60VP. There's no doubt that Toshiba L550-207's users won't come to enjoy DirectX 11 effects. However, this should be bearable in view of the attractive price of less than 700 euro. Two questions are still interesting: What's the HD 5165's performance like in comparison to the popular HD 5650 (DirectX 11)? Will Intel's weakest Arrandale processor, the i3-330M, turn out to be a bottleneck? The first indication is supplied by 3DMark Vantage. We standardly execute this benchmark in a resolution of 1280x1024 (external display). The Satellite L550-207 achieves 2789 points (total score). 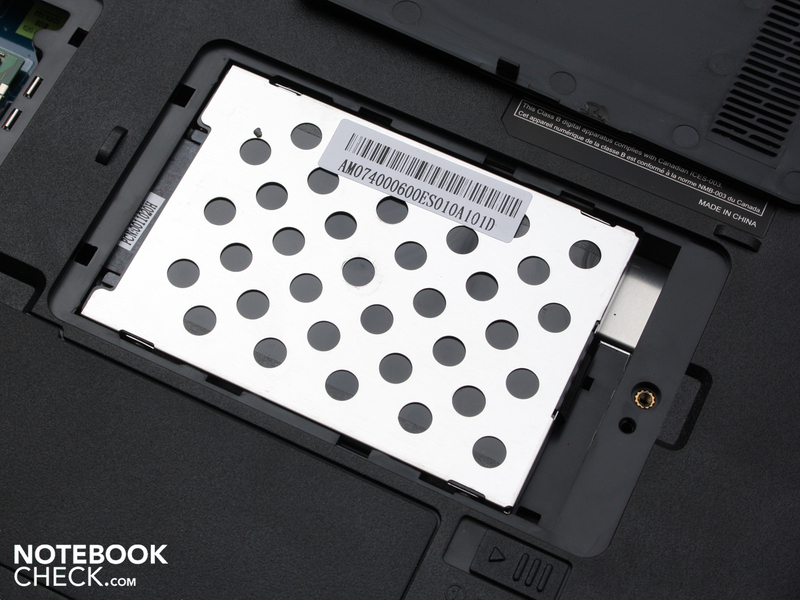 Notebooks with an HD 5650 can achieve up to 3450 points, depending on the processor. The latter is the case in Deviltech's Fire DTX (720QM). The weaker the processor is, the less the difference is in HD 5650 devices compared to the L550-207 at hand. When two equal processors face one another (330M), as in the Acer Aspire 8942G-334G64Mn, the advantage is only 3150 points (13 percent). The HD 4650 successor is first defeated when a lower clocked, DirectX 11 capable HD 5650 comes into play (Sony Vaio VPC-EB1S1E/BJ, 430M, GPU 550Mhz). 3DMark2006 rewards the HD 5650, with the same CPU (330M, Acer Aspire 8942G-334G64Mn), with 415 points more. The test system achieves 6125 points. The gaming tests will answer the question of whether or not the HD 5165 is just as good for gaming as the HD 5650. 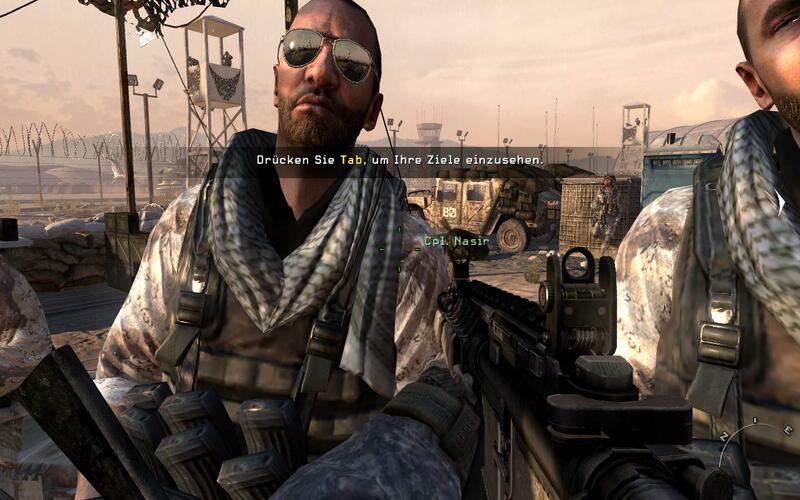 Bad Company 2 doesn't treat mobile hardware with kid-gloves. However, the Satellite L550 is on par with Dell's Studio 1749 (520M) and surpasses Sony's Vaio VPC-EB1S1E/BJ (430M, 550 MHz GPU core). 44 fps are possible in the shooter's medium settings (1280x800, medium, HBAO off, 1xAA, 1xAF). We couldn't apply the resolution of 1366x768 due to the native 1600x900. However, the effort for calculating the pixels seems similar. If you use high settings, you can still count with 29 fps (1280x800, high, HBAO on, 1xAA, 4xAF). Infinity Ward's shooter is also really fun with the Toshiba L550-207. We can skip the low settings. The game runs with 41 fps in medium settings (2xAA, medium details) and 1024x768 pixels. This allows a bit of room for increasing to 1280x800 pixels. It's then still 29 fps, despite increasing the details to high (4xAA). However, the game jolts every now and again in action-packed sequences. 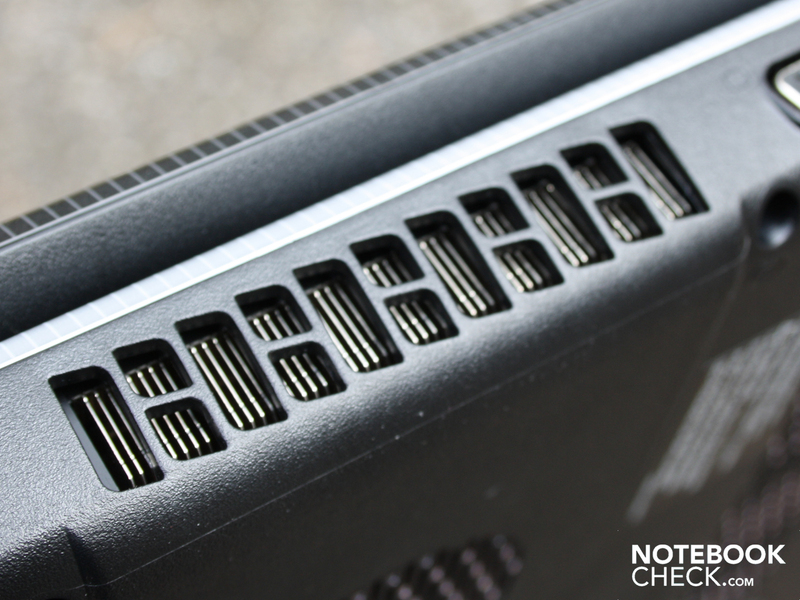 Dell's Studio 1749 proves that a stronger i5-520M only reaps in four additional frames. First a GeForce GTS 250M (49 fps) or a GeForce GTX 285M (61 fps) boost Modern Warfare 2 into the ultimate gaming heaven. Unsurprisingly, the Radeon HD 4650 is on par with 35 fps (Dell Studio 1747, 720QM). The fantasy adventure, Risen, isn't really any longer smoothly playable in high settings (1280x800 pixels, high details, 4xAF) with 23 fps. Reducing it to 1024x768 pixels and medium details (2xAF) also only brings a moderate gain of 33 fps. Risen can be denoted as playable on the Toshiba L550, as it's not a shooter and thus action-packed scenes are rare, gamers wouldn't benefit from a faster processor and a Radeon HD5650, anyway: 37 or even 35 fps in medium details (Deviltech Fire DTX / Packard Bell Easynote TJ75-JO-070GE). We've tested the classic consistently in 1024x768 pixels with the integrated CPU and GPU benchmark. 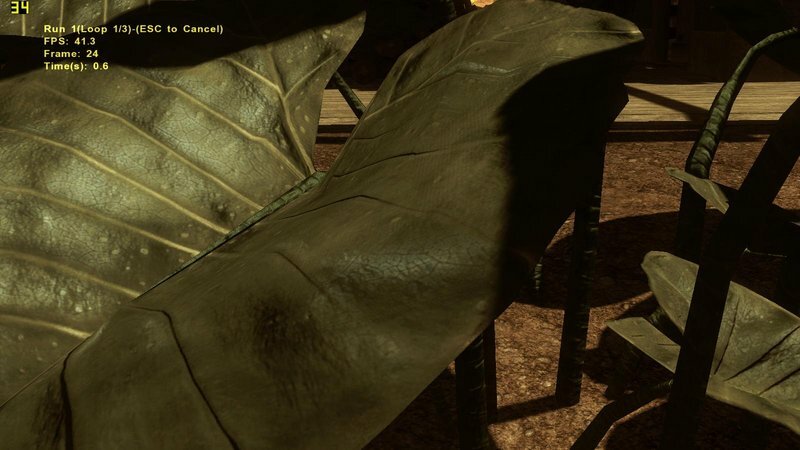 Midrange graphic cards often have problems with the 2007 shooter. 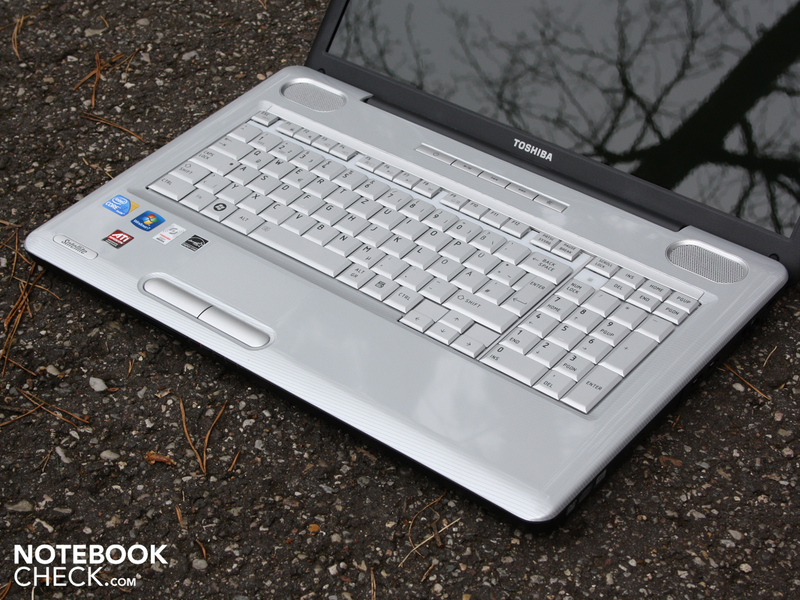 The Toshiba L550-207, however, looks good with 23 (CPU) and 29 (GPU) fps (high details). If you know the game, you'll also know that it repeatedly comes to interruptions in action-packed scenes. 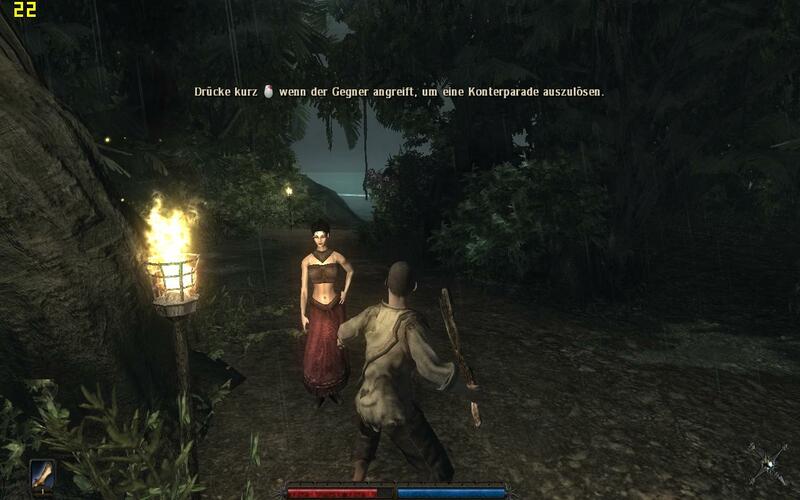 If you reset the details to medium, you can enjoy an exceptionally smooth game play with 44 (CPU) and 53 fps (GPU). You could even consider increasing the resolution to a more pleasant 1280x800. The Radeon HD 5165 is put in a very positive light in comparison to competing systems. The Toshiba L550 places itself next to a Deviltech Fire DTX with a Core i7-720QM with an identical 29 fps (GPU Benchmark, high), despite the weak i3-330M processor. An Acer Aspire 8942G-334G64Mn (i3-330M) is even beat with 27 fps. The HD 4650 lags slightly behind with 26 to 28 fps, whereas these systems usually had been equipped with a less multi-core optimized Core 2 Duo processor. 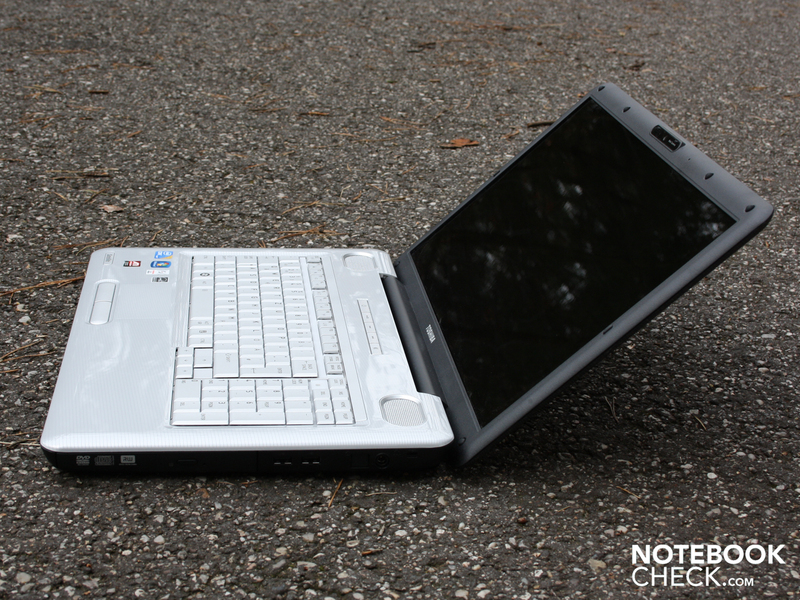 For instance, Samsung R522, Toshiba Satellite A500-15H or HP Pavilion dv6-1211sg. The action shooter's benchmark runs smoothly in 1024x768 pixels, and high details (DirectX 10 effects) with 44 fps. The HD5165 is on par with its colleague, Radeon HD 5650. Higher frame rates of 50 fps are first possible with a Mobility Radeon HD 4850. The upper frame rate allows playing the game in the native 1600x900 pixels smoothly (32 fps). Whilst the 3DMark Vantage grants the ATI HD 5650 up to 20 percent (13 percent with the same CPU) more performance than a HD 5165, the real 3D games are more amiable. The Radeon HD 5165 in Toshiba's Satellite L550-207 places itself on the same performance level as the HD 5650, despite the weaker Arrandale processor (i3-330M) (Bad Company, Modern Warfare 2, FarCry 2) or is even marginally better (Crysis GPU Benchmark). The HD 5165 only scores notably worse in games that can benefit from the Core i5 or i7 CPU's turbo boost (Risen). Aside from frame-nit-picking, it can be said that the Satellite L550-207 is suitable for current games in medium details and resolutions. Ambitioned multimedia laptops can sometimes get a bit loud. The cooling system can turn up to 36 dB(A) during gaming or processor load. The noise stays on an almost constant level. We can first persuade the fan to turn up to the full in the stress test, made up of Furmark & Prime95: 42.6 dB(A). The fan runs almost consistently here. It only varies by 1 dB(A). A difference that is barely audible. If the Satellite L550 isn't used for gaming, it's adequately quiet. The fan fluctuates between lowest activity (30.6 dB(A)) and low activity 33.5 dB(A)) when the processor and graphics are idle. The fan turns on every 2 to 3 minutes for 30 seconds and cools down the heatpipe. Sensitive natures could find this disturbing. This is still acceptable in view of the dedicated graphic card, still manufactured in 55nm. When the computer is put under light load by internet surfing or opening programs sporadically, the frequency above increases to a state where the cooling no longer falls back to its lowest level. The Toshiba prototype shows positive traits in terms of waste heat. Even the waste heat peaks on the surfaces (stress test) are at most 41 degrees Celsius. That sounds like very high, but we only measured these high temperatures on the device's bottom center. However, the notebook's wrist-rest heated up considerably (stress), but doesn't get unpleasantly warm with a maximum of 36 degrees (center). 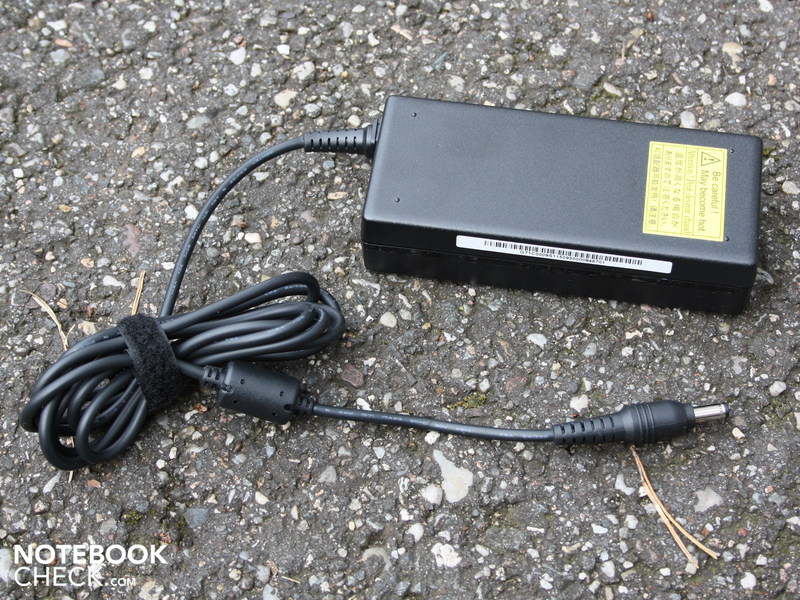 The adapter with a tethered effective power of 77.6 watts gets really warm, but that's still acceptable. We determined 58 degrees on its surface. The average idle temperature on the bottom is merely 27.5 degrees. The wrist-rest remains almost cool with 26 to 29 degrees. The overnight stress test didn't have an impact on the Satellite L550-207's stability. It didn't crash while the fan worked in full speed. A 3DMark2006, executed immediately afterwards, reached about the same rates as in the normal test: 6110 3DMarks (1280x1024). The stereo loudspeakers placed above the keyboard supply an unsatisfactory sound because they have a tendency for trebles. Basses are lacking completely, there isn't a subwoofer. The sound doesn't invite for listening to your favorite band over a longer period. The sound enhancements in the system control don't seem to have any effect. The volume is sufficient for a 17 incher and it doesn't come to contortions or scratching in the maximum level. Connecting external loudspeakers or headphones over a 3.5 millimeter jack will be mandatory for sound connoisseurs. 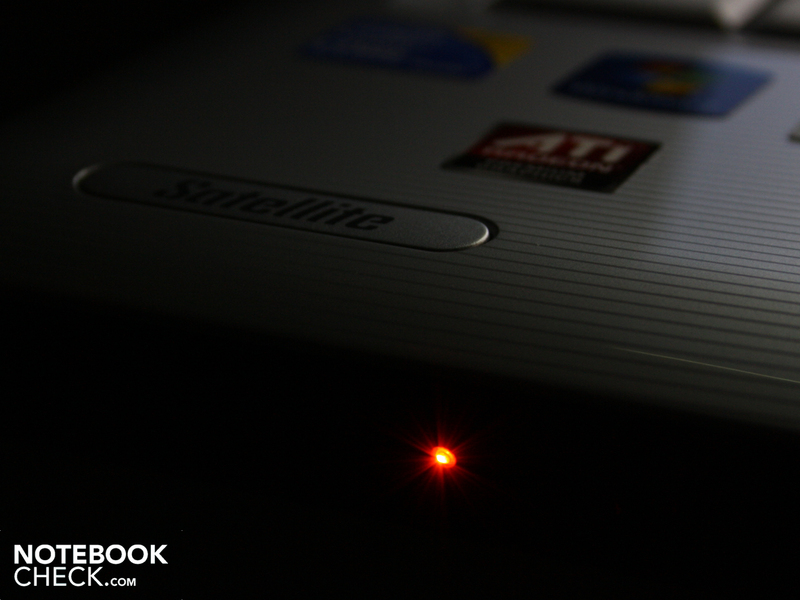 The level tethered to the notebook can be regulated upwards as desired. 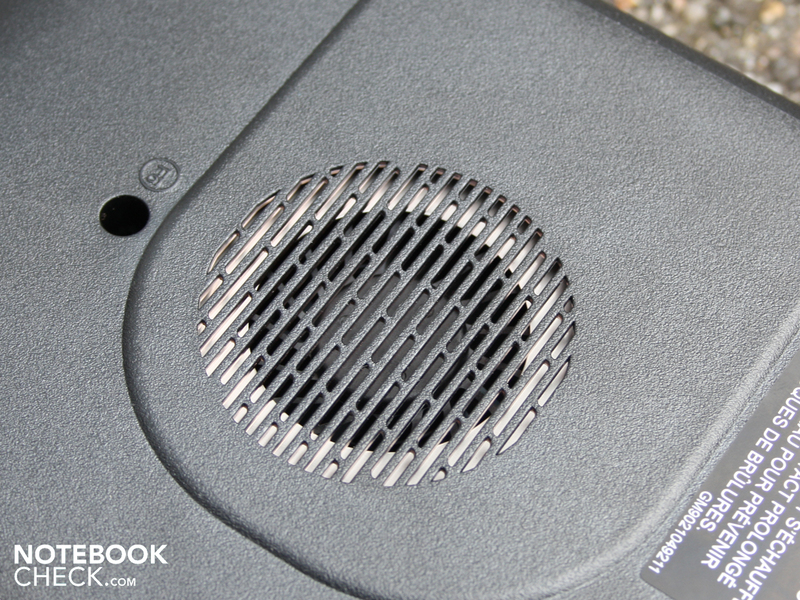 There isn't a humming in external speakers even at a low output level. 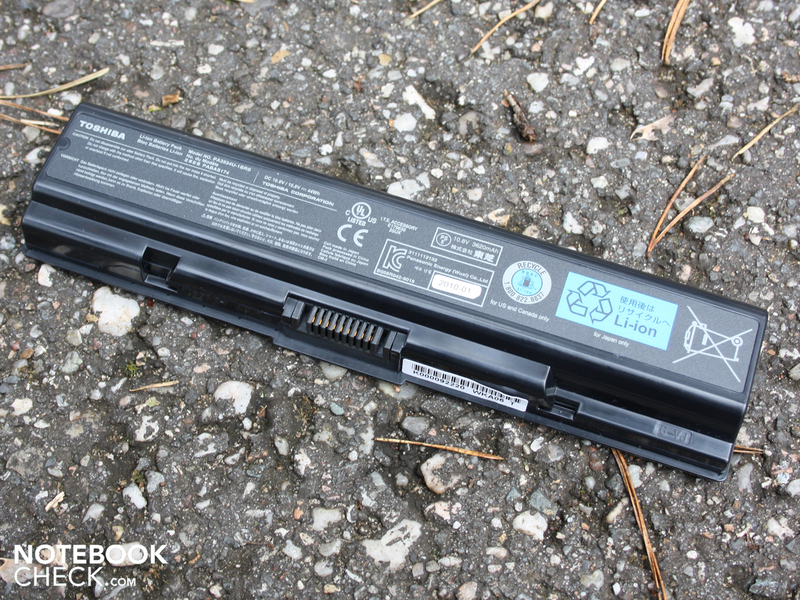 The Toshiba Satellite L550-207 doesn't have a high battery life with the 44 watt hour battery. The internet surfing session with enabled WLAN comes to an end after 2:16 hours (136 minutes). We executed a stream download and called up simple websites afterwards in this time. How long can a DVD movie be rendered? The DVD test stopped at 1:56 hours (116 minutes). The battery was first ready for the next session after almost two hours. The battery needs 1:48 minutes for recharging after a complete discharge. The maximum idle runtime is 3:37 hours (217 minutes). This runtime is naturally unrealistic because we measured in lowest brightness, GPU/CPU idle and disabled WLAN. Toshiba's 17.3 incher turns out to be comparatively power hungry. The idle power consumption is 22.4 watts when all possible energy savings options are exhausted. 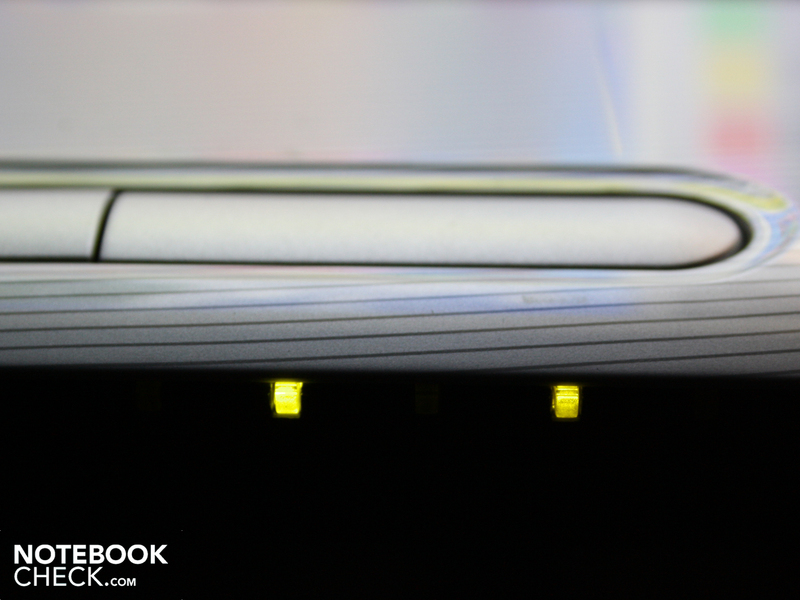 The Asus N71JV, also a 17 incher, is more frugal with energy. It only needs 12.1 watts in a minimum state. Even Samsung's R780-JS03DE (17 inch) with a stronger i5-520M processor and Nvidia Geforce GT 330M only consumes 14.2 watts. The effective power increases to 55 and even up to 77.6 watts under load (always without the battery). We measured the first value during 3DMark2006, which should comply with the power consumption during a 3D game. 77.6 watts are unrealistic for a normal use because it's measured at 100 percent load of graphics and processor (Prime95 & Furmark). 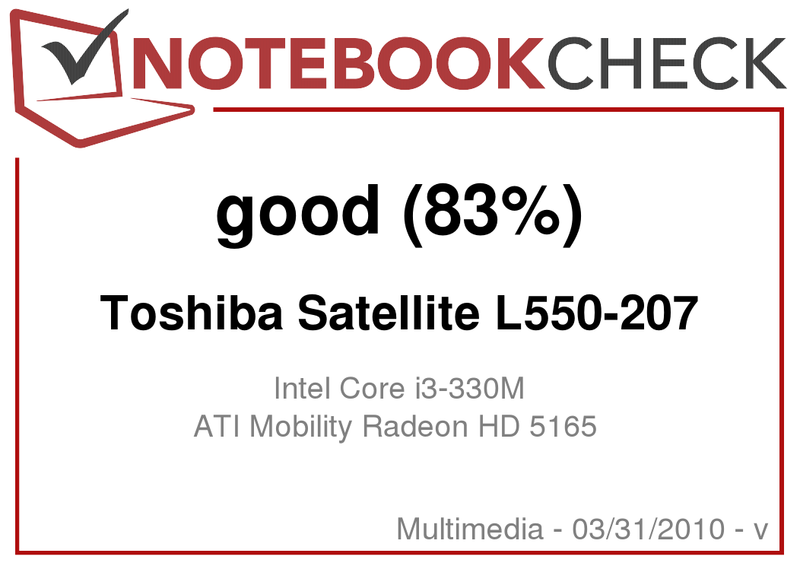 The Toshiba Satellite L550-270 with a Core i3-330M (2.13 GHz) has amazed us with a good gaming performance for the demanded price. That should appeal to many buyers. 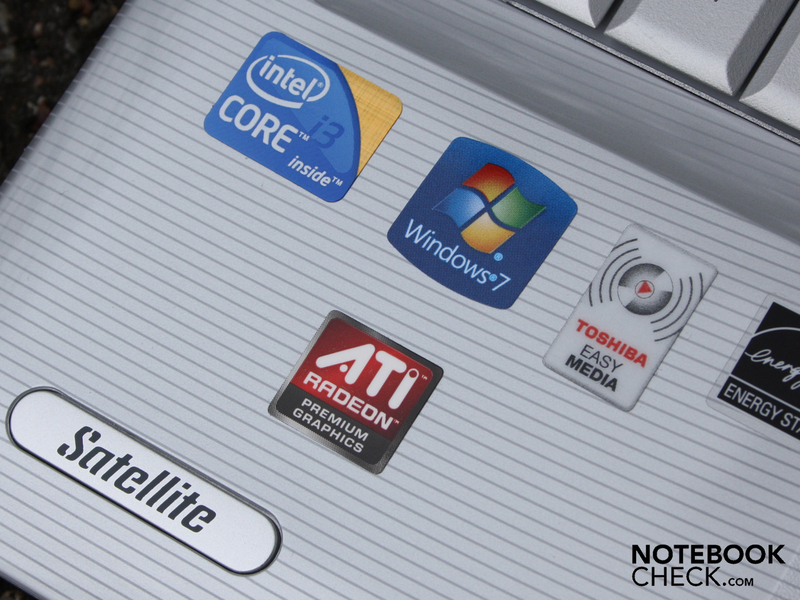 The ATI Mobility Radeon HD 5165, with a clock rate of 600/800 (core/memory), proves to be coequal to the current HD 5650 alternative. The only flaw of the HD 4650 twin is its DirectX 11 incompatibility. The Radeon HD 5165 can display current games, at least in medium details and in a resolution similar to XGA or HD ready. The battery life is modest, though. Two hours of surfing in WLAN at most. 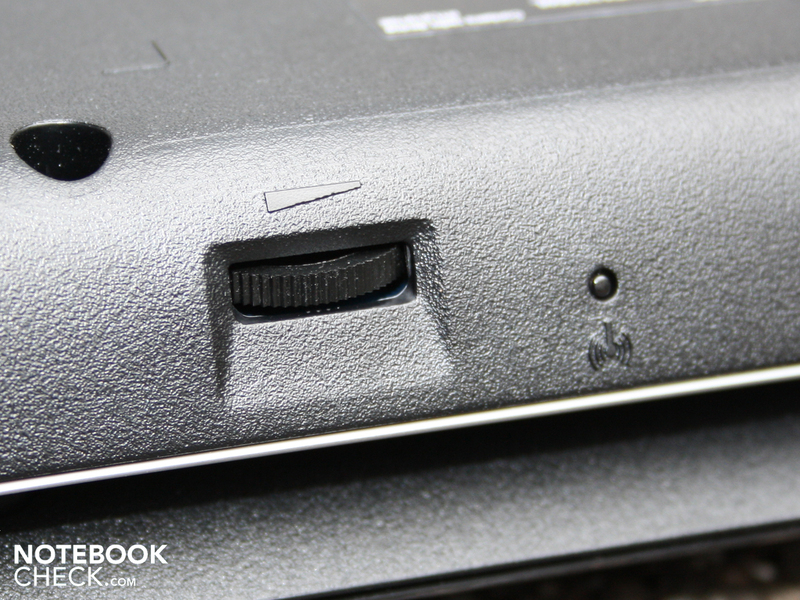 The contrast poor and viewing angle instable display are standards for inexpensive office and multimedia notebooks. Nevertheless, the connectivity turns out to be quite generous with eSATA and ExpressCard 54. 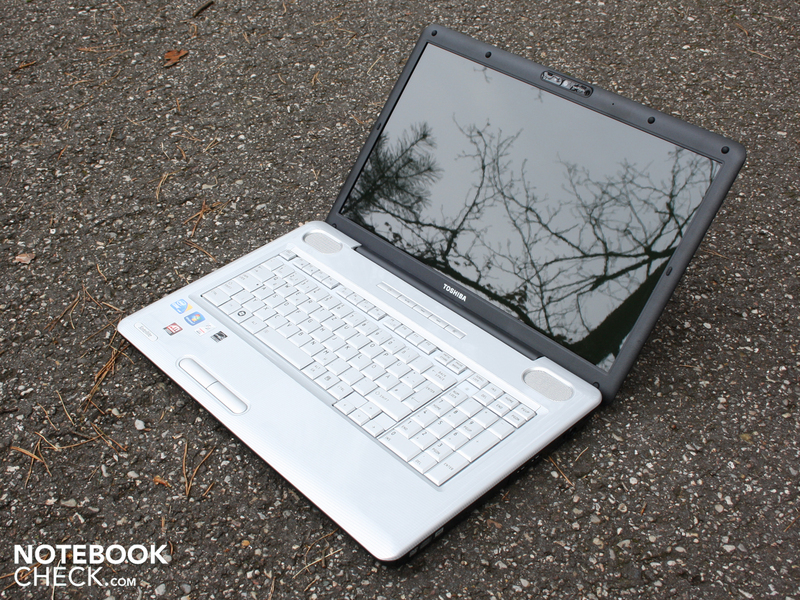 The Toshiba Satellite L550-207 is a very good bargain for 670 euro. It should prove to be difficult to find a comparably strong 17.3 incher, in terms of graphic performance, for the same or even less price. 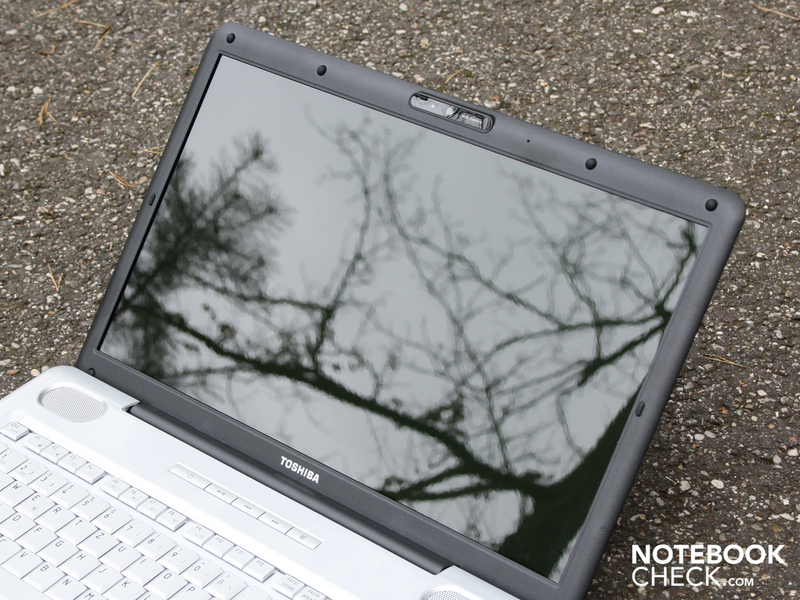 The Toshiba Satellite L550-207 is a somewhat massive 17.3 incher. The other LEDs (HDD, battery status, mains, memory card) are also difficult to see. The webcam, fortunately, has the overview. Even over the scanty supplies. 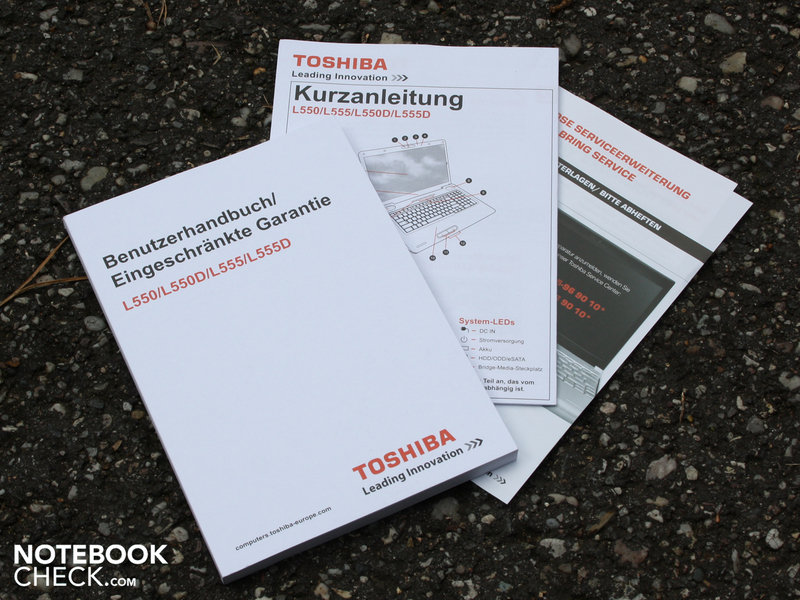 There aren't any recovery DVDs, merely a German manual. The large dimensions won't fit in every backpack. If you're planning to take the 17.3 incher on a longer journey, you'll be received by annoying reflections in sunlight. The 44 Wh battery's runtime isn't the best with a good two hours. The 363 gram heavy adapter should always be at hand. and the 500 GB hard disk. Other module (e.g. wireless) can't be as easily replaced. By the way, the HDD comes from Toshiba. The WLAN status LED is placed unfavorably on the 17.3 incher's lower front part. Unfortunately, the keys deflect evidently and the touchpad keys emit a hollow noise. It is accompanied by a strong ATI HD 5165 graphic for around 670 euro. but doesn't differ in color from its surrounding. Gray in gray is the motto. The loudspeakers have been placed strikingly above the keyboard's right and left. Its loud but treble-prone sound can't convince us. The modem cable (RJ-11) has been abandoned in the meantime. The volume dial (endless) is one of the Satellite L550-207's details worth welcoming. The base feet at the rear lift the case quite a bit for a better subconstruction ventilation. The multimedia claim is emphasized by these player buttons (play, stop, forward, mute). as well as the generous gaps in the keyboard areas. 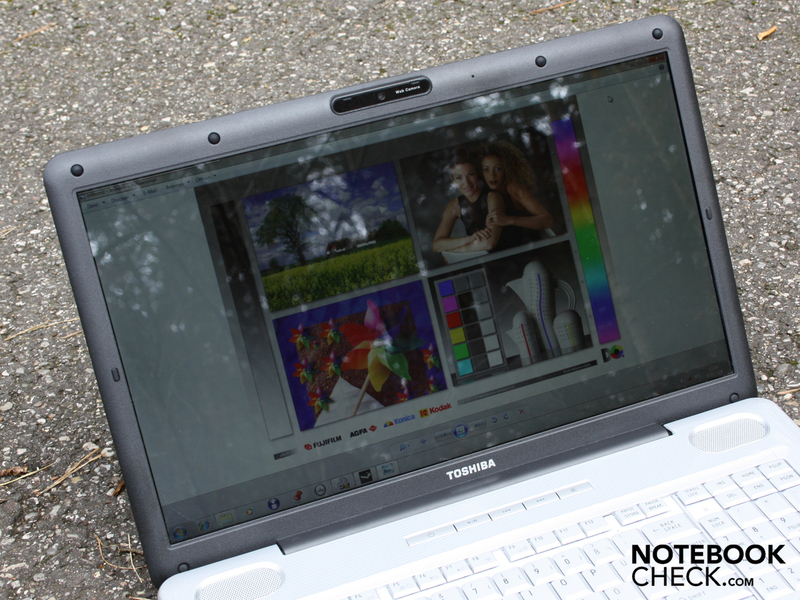 Toshiba Satellite L550-207: A 17.3 inch multimedia notebook with a very good value for money ratio at 670 euro. 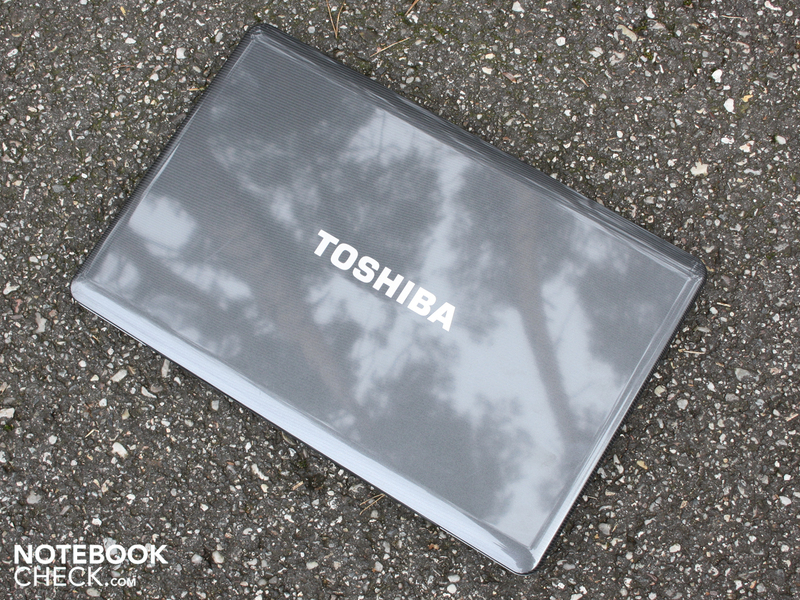 Toshiba is back with interesting hardware. The completed package makes the L550-207 interesting for gamers, office users and entertainment fans alike. 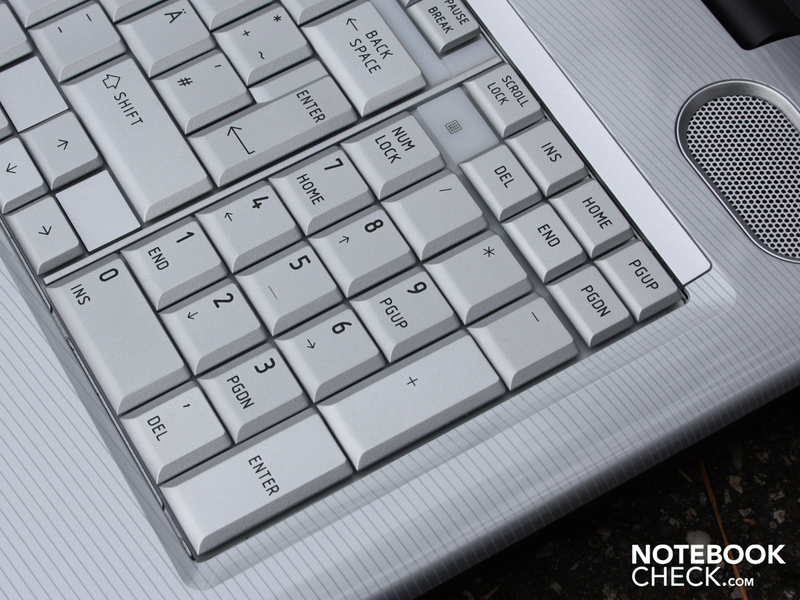 The once otherwise perfect keyboard that now downgrades itself with a yielding base is a shame for the L550. If Nvidia sells its old graphic chips under a new label, why shouldn't AMD/ATI be allowed to? Dell Studio 1749: with a HD 5650 and 520M CPU stronger, but also more expensive with about 1000 euro. The Studio stands above any manufacturing flaws. Acer Aspire 8942G: 18.4 incher with HD 5650. More expensive with 900 euro but is equipped with many connections. Samsung R780: with a 520M and GT330 seen overall faster, average workmanship and with 900 euro also expensive. Medion X7811: 17 inch gamer with an HD 5870 and 720QM for 1000 euro. A price whopper for "hot" hardware.